Snrky: Which way is the door? Which way is the door? Directionally correct is one of my least favorite phrases/bits of jargon. While it's supposed to mean, we have a mutual understanding and we're all headed the same direction, so it will work out, what it really seems to mean is we don't have time to finish this task or estimate, so we're just going to trust we're headed the right direction without appropriate spikes or any sort of real design. Worse is when it means you gave us something that looks like an estimate, even though you were the only one involved, so we're going to hang it on your head, although we'll call it hanging it on your expertise. Apparently I'm not the only one who has problems with the phrase. There are entries out there for it over the last half a decade. Snarky: The PM said to remain directionally correct. 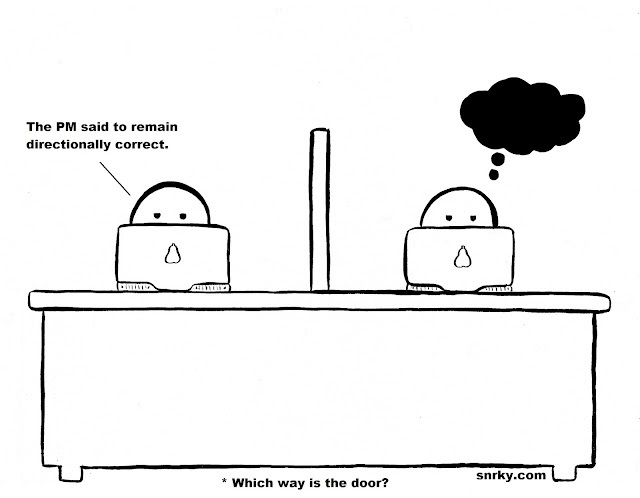 Title: Which way is the door?